How many of us heard our parents say “Eat your carrots, eat your carrots, eat your carrots,” and now it’s one of those phrases that forever plays out in our heads at mealtimes? As pressing as those words may be, they’re not without merit. Carrots are a superfood and they do “make your eyes shine,” but not in the way most people think. As one of the most popular root vegetables worldwide, carrots offer a lot of nutritional benefits, especially when eaten raw and even more so in juice form. Carrots and carrot juice benefits range from nourishing the structures that enable vision to improving cholesterol levels and helping with weight loss. Keep reading to uncover the myths surrounding this hearty vegetable and the very real nutritional benefits carrots and carrot juice have to offer. 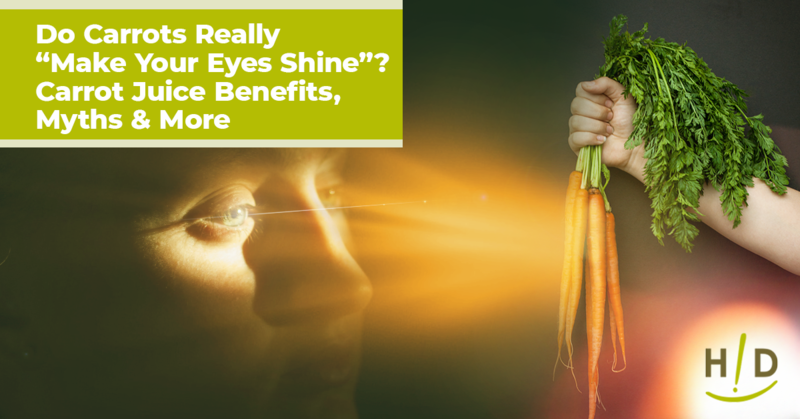 How Do Carrots Nourish the Eyes? Along with other essential nutrients, carrots contain ample amounts of beta-carotene, a pigment material that accounts for their orange color. The human body uses beta-carotene to make vitamin A. As far as eye health goes, vitamin A enables the eyes to convert light into a signal that’s sent to the brain. This signal allows the eyes to see under conditions of low light. Although greens vegetables are the main source of the yellow pigment lutein, carrots also contain lutein, another essential nutrient for maintaining eye health. Lutein has antioxidant properties that help keep the central part of the retina from deteriorating. Also known as the macula, this area of the retina keeps your vision clear and free of distortions or blurriness. In effect, lutein increases the thickness of the macula and prevents it from deteriorating. Carrot and carrot juice benefits for the eyes stem from their high levels of beta-carotene and lutein. While eating lots of carrots will help support healthy vision, doing so won’t eliminate the need for glasses or contacts if you already need them. Carrot and carrot juice benefits support the physical structures that enable vision, and that’s it. Eating carrots won’t improve your vision. On the other hand, if you have a vitamin A deficiency (which is a rarity in the Western world) eating more carrots may help you see better. The same goes in cases of severe alcoholism, as well as in cases where the body is unable to properly absorb vitamin A. Carrots may well be a healthy source of beta-carotene and vitamin A, but other types of vegetables also offer high amounts of these nutrients. In fact, some vegetables, such as kale, spinach, and even sweet potatoes, deliver higher amounts of vitamin A than the body can convert from carrots. These vegetables are also good sources of vitamin E and C, both of which support healthy eyes. Vitamin A is a fat-soluble material. This means eating a healthy fat along with carrots helps the body fully absorb the vitamin A it produces from beta-carotene. Guacamole and almond butter are two healthy fats that pair nicely with raw carrot sticks. Like any other area of the body, the eyes require a balanced mix of different nutrients to function at their very best. 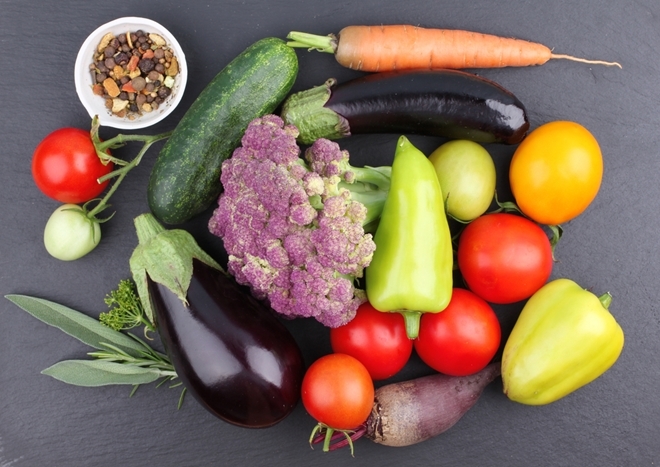 In this respect, a balanced diet that incorporates the full spectrum of essential nutrients, high fiber, and omega 3 fatty acids can support the different structures and systems that contribute to healthy sight. Examples of these types of foods include blueberries, fish oil, walnuts, flax seeds, and any fruit or vegetable high in vitamins E and C.
Carrots vs Carrot Juice: Which One Packs the Biggest Nutritional Punch? As with most products on the shelf, not all carrot juice products are created equal. Our New Generation CarrotJuiceMax offers a rich source of beta-carotene along with a healthy balance of vitamins, minerals, and enzymes. 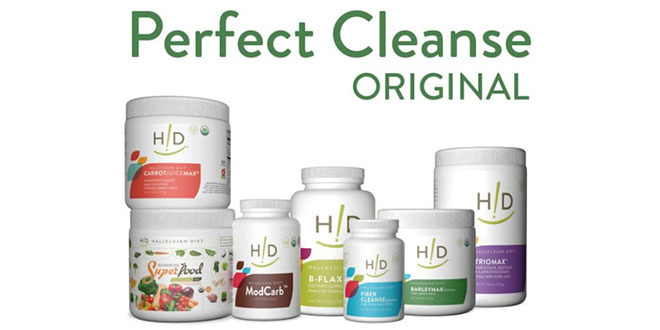 In addition, our organic formula uses a proprietary dehydration process that’s designed to protect these vital nutrients. Whether mixed with water or a fruit or vegetable juice combo, New Generation CarrotJuiceMax delivers a sweet, wholesome taste without the use of preservatives or artificial ingredients. 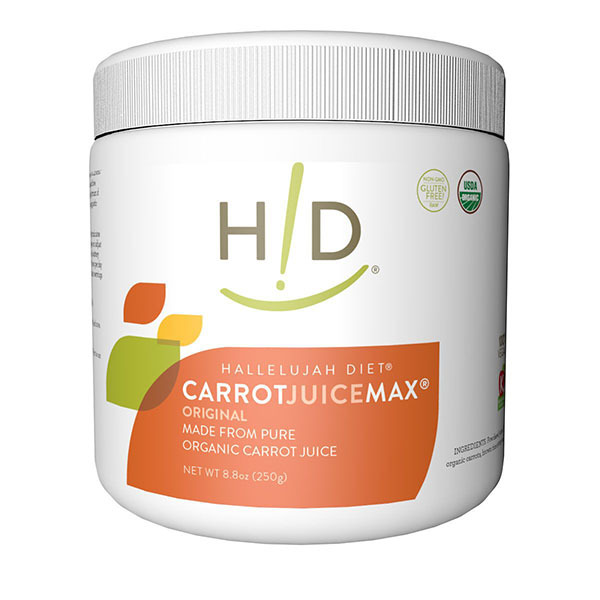 If you’re wanting to support your eye health for years to come, Hallelujah Diet’s New Generation CarrotJuiceMax is the way to go! From this article, I learn that carrot juice can help improve eyesight, help with weight loss, and improve cholesterol level. Carrot and carrot juice benefits for the eyes come from their high levels of beta-carotene and lutein.The body uses beta-carotene (the orange color) to make Vitamin A, which helps the eyes to see in low light. Carrots also contain lutein ( the same a green vegetables do). The macula, (part of the retina) keeps your vision clear and free of distortions or blurriness. Lutein increases the thickness of the macula and prevents it from deteriorating. Carrots and other vegetables such as kale, spinach, and even sweet potatoes, deliver high amounts of vitamin A to the body. Healthy fats like guacamole and almond butter can help my body absorb the Vitamin A. What a great article on carrot juice! This is such imformative information and so important for us to read and utilize. Our eyes are something to not take for granted.